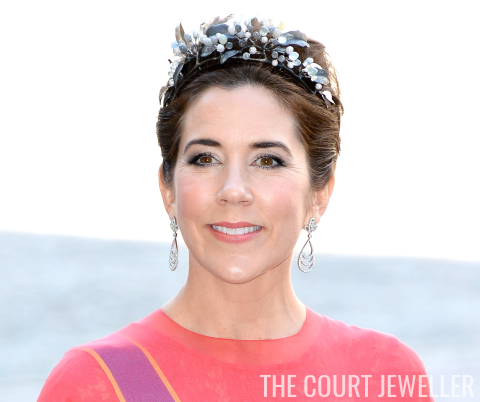 While the Danish royal jewel collection includes a number of antique heirloom tiaras, the women of the family also have a few contemporary diadems at their disposal. 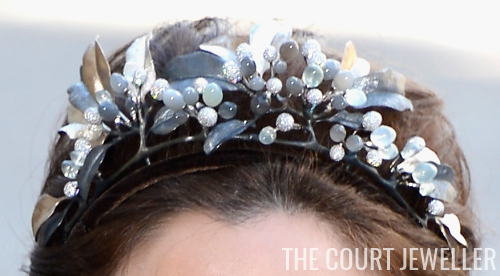 This modern sparkler, the Midnight Tiara, is worn exclusively by the nation's future queen. 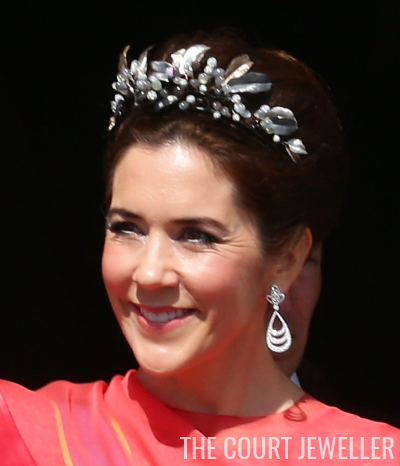 Crown Princess Mary wears four tiaras: today's sparkler, her wedding tiara (in both all-diamond and diamond-and-pearl configurations), her Edwardian necklace/tiara, and the historic Danish Ruby Parure Tiara. Of the four, the Midnight is the only one that she doesn't personally own. It was created in 2009 by Charlotte Lynggaard and craftsmen and women of the Ole Lynggaard workshop. The piece features diamond and moonstone "berries" nestled among leaves of rose gold, white gold, and oxidized silver. It was originally displayed alongside historic Danish royal diadems as a part of a tiara exhibition at the Amalienborg Palace Museum. The tiara, which also has a coordinating brooch and pair of earrings, was designed with the crown princess's Australian heritage in mind: the leaves and berries are said to have been made to resemble the Golden Wattle, a symbol of the nation. Mary first wore the tiara in public in 2009 at a party in honor of the 75th birthday of her father-in-law, Prince Henrik. Since then, she has worn it at several other high-profile occasions, including Queen Margrethe's 70th birthday celebrations and the wedding of Princess Madeleine of Sweden in 2013. 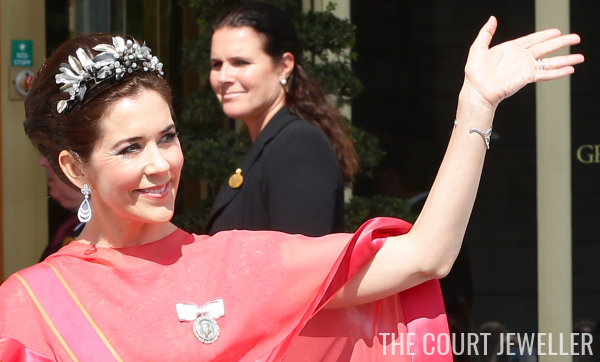 But although she is the only person who wears the tiara, Mary doesn't actually own the piece. Rather than purchasing the tiara, which is valued at nearly $300,000, a deal was made that gives Mary the exclusive right to wear the tiara, while the Ole Lynggaard company is the actual owner. Note: This is an updated version, with new information and photos, of an earlier post.